Dr. Wellington J Rody, Jr., Associate Professor and Chair, Department of Orthodontics & Pediatric Dentistry, leads research through an award granted by the National Institutes of Health. September 2018 - Stony Brook University School of Dental Medicine (SDM) has received a two-year $319,000 research grant from the National Institute of Dental & Craniofacial Research (NIDCR) of the National Institutes of Health (NIH) for the development of a noninvasive method to detect and monitor periodontal disease and dental root resorption. The project is led by SDM’s Dr. Wellington J Rody, Jr., Associate Professor and Chair, Department of Orthodontics & Pediatric Dentistry. Dr. Rody joined SDM this year from the University of Florida, Gainesville, and is a diplomate of the American Board of Orthodontics and a member of the Edward H. Angle Society of Orthodontists. 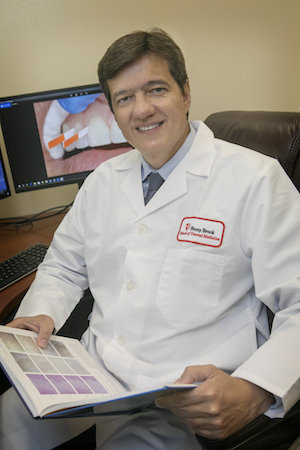 Dr. Rody’s research will use oral fluids to identify biomarkers that may help in the detection of periodontal disease and dental resorption at the beginning of their progression. Currently, x-rays and images are used to monitor these conditions; however, when they are detected through these methods, it is often too late to prevent and reverse the damage. Additionally, images may not indicate if the destructive process is ongoing or historical. Root resorption and periodontal disease can lead to the loss of permanent teeth with root resorption dissolving the tooth’s root structure, and periodontal disease deteriorating the gums and bone support of the tooth. The risks associated with radiation have caused many dentists to curtail the use of x-rays and CT scans on a routine basis. In cases where these methods are avoided, clinicians lose a crucial diagnostic tool due to the frequently asymptomatic nature of both root resorption and periodontal disease. Evidence suggests that the cells that destroy bone and teeth release small vesicles called 'exosomes’ into a fluid secreted by the gums. In Dr. Rody’s research, he will study the composition of these small vesicles to find out if they can be used to diagnose and monitor bone or tooth destruction without the need for radiation.